Monday, we had another viewer for the finca, but she isn't going to want here, she wants a finca where she can have music up at maximum volume, and since the local bye-law came in, that means you have your electricity cut off, so Copacabana is not for her, unless she can find one out in the wilds with no neighbours! 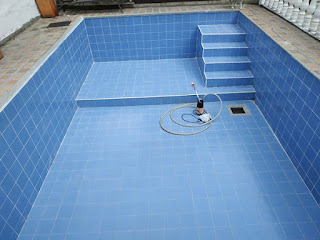 Yesterday, I spent the morning de and re-grouting in the pool, I got quite a lot done, and now completed three walls. with all the broken tiles replaced, I have just got to finish this end wall you can't see in the photo, then it is finished, and leaves me with the floor, which to be honest, I am not sure can be done until the next dry season, as most of the time there is standing water, except maybe the shallow end, I might get that and the steps done. I am really pleased with the finish, I don't know why we ever tried to regrout it with dark grout when we first came here, it looks much better with white grout. This morning I had to go into the city for an ultrasound on my right hand, it keeps swelling up and is painful to the touch most of the time, my Doc thought it might be a ganglion cyst, but the ultra sound found nothing there, so it is probably just something else I will have to live with..
From there we went on to collect the results of Marcela's two MRIs they have found a problem, now we just have to wait and see what can be done, she has an appointment tomorrow, so we may know more after that. Unfortunately, the Clinic she goes to, has closed one of it's car parks as they intend to build on it, but that leaves them short of parking space, I was sat in the queue, whilst Marcela jumped out and went to get her results, and the car died (Montero) the gas has been playing up since Javier did the valve work. Some nice gentlemen gave me a push to get it going on petrol, and then an even nicer Security Guard let me sneak in to the Emergency Dept. car park, I think because I explained Marcela was inside, and being a Foreigner he took pity. On the way back we went and saw Javier, who despite messing with it, couldn't get it right, so sent us round to the Gas engineer, who cleaned, and recalibrated the system, he thinks there is an electrical problem, but Javier says he is talking rubbish, because it is firing up, so now they have both had a go, I am trying it out, after lunch with Marcela, she went off to work, and I trundled to Copacabana to do the shopping, I have a sneaky suspicion the problem is still there, if I have time, I will take it for another run tomorrow, it may have to go back again.